This beautiful 2 Oz Silver coin is dedicated to one of the first calendars known to man and one of the most famous symbols in history the Mayan Calendar. The coin features a wonderful High Relief, has a beautiful design, has an Antique Finish quality and comes in a beautiful case, along with the Certificate of Authenticity. Limited mintage of only 500 pcs worldwide! 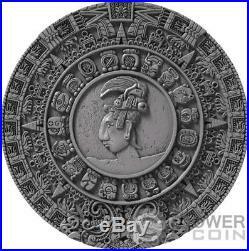 The reverse of the coin depicts the beautiful and wonderful detailed high relief image of the Mayan Calendar. The obverse of the coin portrays the effigy of Her Majesty Queen Elizabeth II surrounded by beautiful Mayan elements and the inscriptions: ELIZABETH II the name of the Queen, NIUE ISLAND - the issuing country, 2018 the year of issue, FIVE DOLLARS the face value and THE MAYAN CALENDAR the name of the coin. Mayan Calendar The Maya calendar is a system of calendars used in pre-Columbian Mesoamerica and in many modern communities in the Guatemalan highlands, Veracruz, Oaxaca and Chiapas, Mexico. The essentials of the Maya calendar are based upon a system which had been in common use throughout the region, dating back to at least the 5th century BCE. It shares many aspects with calendars employed by other earlier Mesoamerican civilizations, such as the Zapotec and Olmec and contemporary or later ones such as the Mixtec and Aztec calendars. By the Maya mythological tradition, as documented in Colonial Yucatec accounts and reconstructed from Late Classic and Postclassic inscriptions, the deity Itzamna is frequently credited with bringing the knowledge of the calendar system to the ancestral Maya, along with writing in general and other foundational aspects of Maya culture. 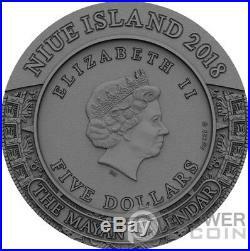 The item "MAYAN CALENDAR Archeology Symbolism 2 Oz Silver Coin 5$ Niue 2018" is in sale since Monday, November 19, 2018. This item is in the category "Coins & Paper Money\Coins\ World\Australia & Oceania\Other Oceania Coins". The seller is "powercoin_italy" and is located in Roma. This item can be shipped worldwide.